Rosemoor’s five-week-long Rose Festival offers a breath-taking showcase of colours and scents of the nation’s favourite flower. Boasting one of the UK’s largest collections of roses, RHS Garden Rosemoor is home to two dedicated rose gardens, bringing together more than 2,000 roses across more than 200 different varieties and a wealth of hues and perfumes. From cottage garden climbers, to bright and beautiful container varieties, there will be a rose to inspire and suit all gardens. As well as the stunning gardens, visitors can enjoy guided tours, expert advice from RHS horticulturists, a floral themed craft market, a rose trail, and much, much more. To celebrate the centenary of the end of the First World War and in memory of those who lost their lives, Rosemoor has planted a group of Rosa Pax. Latin for ‘peace’, Rosa ‘Pax’ is a hybrid musk rose and was developed by the rose breeder, Joseph Pemberton and launched in 1918 to commemorate the end of WW1. Rosemoor’s Garden Kitchen Restaurant will be celebrating roses throughout the month with a delectable series of rose-inspired and rose-infused treats, from rose meringues to rose and raspberry cakes. 100 red ceramic poppies, interpreted and designed by popular local artist Renée Kilburn, will be on display to start the Garden’s commemorations of the centenary of the end of the First World War. Standing within the display is a magnificent sculpture of a lifesize ‘Unknown Soldier’, although ours is affectionately known as George N and is created by another popular Rosemoor sculptor - George Hider. Armed forces personnel, both serving and retired together with a family guest, have free admission to Rosemoor today – simply bring ID / proof of status. The display will stay up until 11 November when the Garden will once again welcome all serving and retired armed forces personnel plus a family guest in for free (simply bring proof to the front entrance). Then the display will continue to be displayed as part of the annual Winter Sculpture Exhibition. The red poppies are available to purchase (£28 each), with a £3.50 donation on every poppy sold going to the Royal British Legion Poppy appeal. 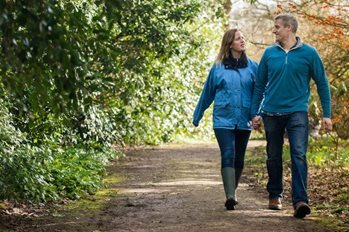 Come along to our Rose Weekend, where you can get specialist rose advice, take free guided walks around the stunning rose gardens and browse the floral-themed craft fair in The Garden Room. In July - Thurs 5 and then Fridays 13, 20 and 27. The Garden will be open until 9pm and visitors can enjoy the gardens at dusk as the roses release their evening scent. Special offer of ‘5 after 5’ - £5 garden admission after 5pm. There will be live music and the restaurant will be serving delicious evening meals too (advance table reservations highly recommended). Every Wednesday, there will rose-themed afternoon teas (pre-booking required) including Flower arranging demonstration with English roses and be present for a Q & A session with the florist of the day. This will take visitors on a historic, scented journey throughout the 65-acre garden and includes stunning rose varieties and their fascinating stories from the Queen Mother’s Rose Garden and the Shrub Rose Garden, down the Long Borders, the Cottage Garden, as well as other roses at Rosemoor House. WE have all kinds of special events, workshops and live entertainment at RHS Garden Rosemoor over the Sunmer. Find out more.